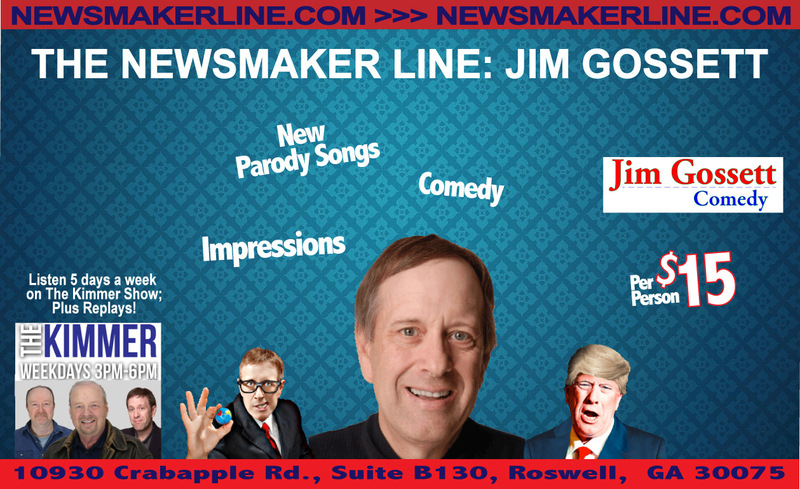 Jim Gossett, the NewsMaker Line on News Radio 106.7 fm, the Kimmer Radio Show Monday-Friday. Scroll down and click to purchase. As always Gossett takes his inspiration from the events of the day, adds his special brand of magic, and delivers a performance so up-to-the-minute. Kimmer will be there to heckle every character Jim plays. Satirical bits so up to date you never know what to expect! Political humor and his Trump makes the NewsMaker Line truly on top of the world right now. Arrive early to purchase food from restaurant. Click Link for Your Show!